Hola peeps! 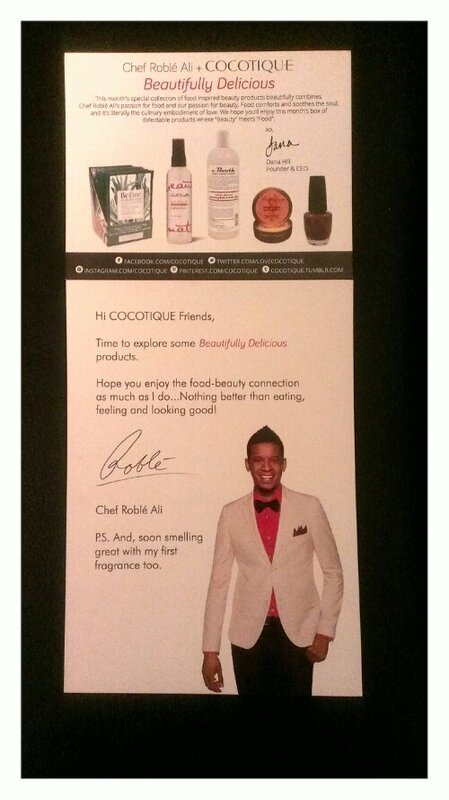 Today I have a great review bought to you by the fab Cocotique box! If you don’t know Cocotique is a “deluxe box subscription service for women of color and diverse ethnicities“. Last month (yes January) the über popular Chef Roblé Ali curated a limited edition box, appropriately called ‘Beautifully Delicious’. Are you intrigued yet? Well read on and take a peek to see what was inside! Befine Fine Food Skin Care– Warming Clay Mask, Night Cream, Gentle Cleanser, Exfoliating Cleanser, Daily Moisturizer, and Pore Refining Treatment Scrub samples were inside. **I’ve tried their products before and they are great. They don’t contain harsh chemicals, are all natural and get the job done. Carol’s Daughter– Macadamia Finishing Shine Spray **If you follow this blog then you know that I have given this brand rave reviews before. I have yet to try this but if it is anything like her Tui Moisturizing Hair Sheen then I know I will love it! c. Booth– Honey Almond Nourishing Bath and Body Wash **I have yet to try this product but I have heard good things about them. The smell is very enticing and I will be using this very soon. Clo-Vee Products– Pomegranate and Orange Organic Shea Body Butter **I can’t wait to use this as I know that it will come in handy and soothe my dry skin. Again the scent of this is divine. OPI Nail Lacquers– San Francisco Collection: I Knead Sour Dough **I have used OPI nail polishes many times before and they do last. I adore the color name and it is appropriate for this everlasting winter season! 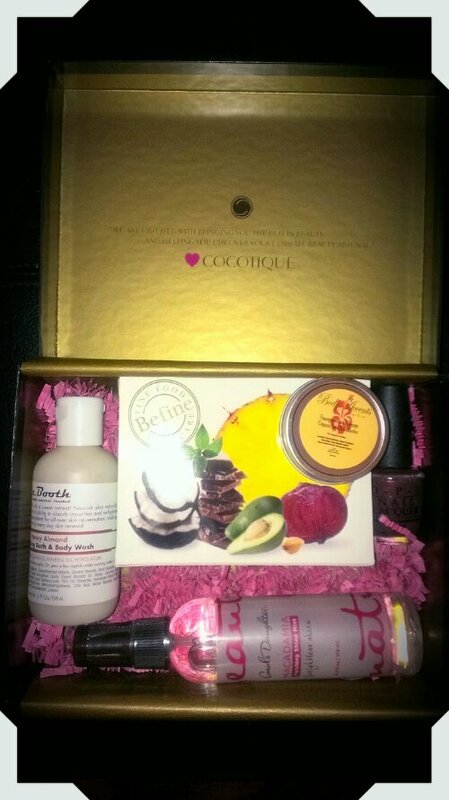 Want to find out more about how to sign up for a Cocotique box go here. Enjoy!